Enter the items by touch screen. Suitable for Cafe & Restaurant. Auto update in stock control. Able to monitor the stocks level. Able to know the top selling products in the company. Fast and easy to use by scanning the bar code. Proper item descriptions and prices are printed on the receipt. 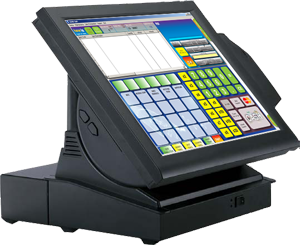 Fast ordering system in Food and Beverages System. Mutiple bill types and payment options. User access level for changing Prices, Discount and Delete Bills. Able to support with personal computer and just by adding the receipt printer, scanner and cash drawer. Able to integrate with inventory system to control the stocks. Able to give discount on the point of sales. Defineable Government Tax and Service Charge.